Free Download Blaze Media Pro 10.0 - Powerful audio and video management tool. Blaze Media Pro is a complete solution for your audio and video collection. It can play a variety of popular audio and video formats, so there is no need to keep different players for music and for movies on your system anymore. Just associate Blaze Media Pro with supported media formats and forget the hassle of probing other players when trying to listen to your music or watching a movie. But the main value of Blaze Media Pro is provided by its integrated tools. Want to convert an audio file from one format to another? Run the audio converter tool by clicking "Convert audio" on the right pane. Need to convert video? No problem, there is a video converter tool. The program can also record audio, edit ID3 tags, rip Audio CDs, merge audio files (even those that are in different formats), download information about albums from CDDB, search for lyrics. Its audio editor is able to apply different effects to your music, like echo, chorus, reverb, fade in, fade out etc. Video processing capabilities are also impressive. Blaze Media Pro can capture video from available video devices (for example, from a TV tuner or a webcam), rip DVD movies, create videos from pictures or photos, decompile videos, extract audio from movies. The built-in video editor can be used to split or join video files, adjust color settings of a video file, apply a number of configurable video effects. Blaze Media Pro supports AVI, WMV, ASF, MPG (MPEG-1 and MPEG-2) video formats. After you process your audio and video files, you may want to burn them to a CD or DVD. 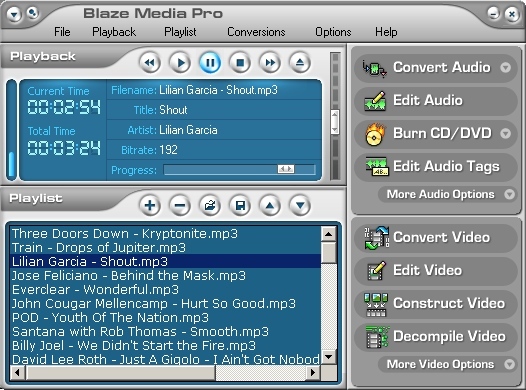 Blaze Media Pro has a built-in CD/DVD burning tool that supports all popular CD and DVD formats: Audio CD, Video CD (including VCD and SVCD formats), Video DVD, Data CD/DVD. All in all Blaze Media Pro is a powerful multimedia application that can replace a number of specialized tools on your computer. Try it to love it! Advantages: great number of supported audio and video formats, rich converting capabilities, easy-to-use interface, great effects. Drawbacks: when installing, setup is a bit slow to initialize. Summary: user-friendly audio and video player with powerful utilities for processing, converting, ripping and burning audio and video files. Blaze Media Pro is a fairly viable option for those who want to record audio files from tapes or turntables. To that extent, if only that, it does what its promos say it will do. The real problems occur after you buy the software – that’s when you find that your expectations aren’t being met, and there’s nothing you can do about it. My advice is not to spend $50 on Blaze Media Pro unless you really need and will use all the features on a regular basis, and are willing to pay for them repeatedly. Otherwise, there is a lot of software out there that will do most or all of what BMP does, and some of it is totally free. You might need more than one freeware program to do everything BMP will do, but it will also save you 50 bucks and a lot of frustration. BMP is expensive for the good you get from it, too. The audio features work much better than the video features, which are slow and cumbersome, so you may find that you end up editing video in a different program, anyway.